Nine blocks of the flying geese quilt are pieced together and the backing sections are ready to be assembled......but that's been put aside now for another day. I am ready to start something new! 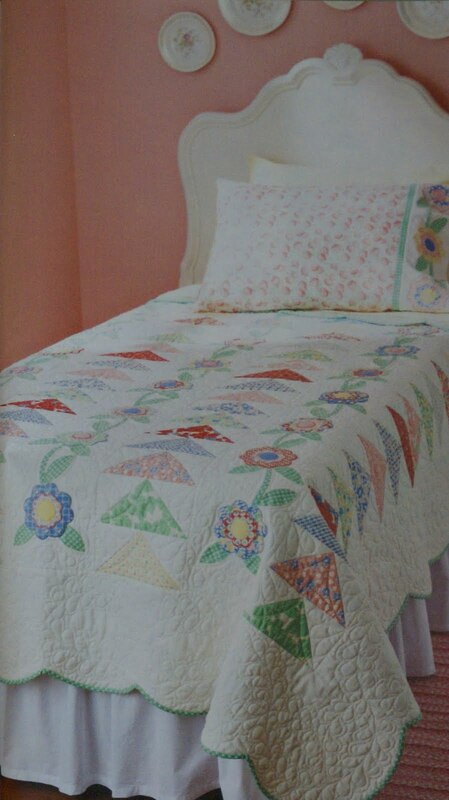 In the April 2010 issue of American Patchwork & Quilting is a pattern call "Flying into Spring" by Eleanor Burns. I like the layout of the quilt - Flying Geese (again?) with applique flowers and vines - but I'm going to make it in these pinks, yellows and greens from my stash. I love this colour combination. I'll probably modify the size a bit too - I'd like the quilt to be slightly wider than the pattern. 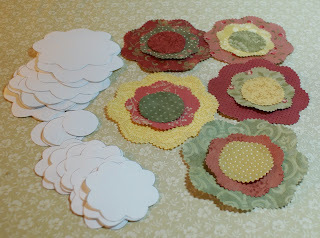 I'm also thinking about including a few more applique shapes. I didn't have enough yardage of the small floral print for the background or the large floral print for the backing so I've ordered more from Shabby Fabrics. While I wait for that package to arrive I've started on the applique shapes. There are lots of them to make so this part of the project will keep me busy for a while. That is a lovely pattern and I love the white and crsip background of the quilt. Your fabrics are beautiful.